I have weened myself off my fair share of vices in the past five years, which, I suppose, is a good thing. Damn admirable, right? Sure! Thank you. But I still have some habits that will die hard or I will hold onto until Dec. 12, 2012. Chief among them is coffee. It’s a chicken-or-the-egg, damned-if-ya do ... catch 22 ... something or other situation: If I drink fewer cups I’ll sleep more ... I don’t sleep, so I gotta caffeinate to function. Whooo! What a fun treadmill! Anyway, coffee’s wonderful. And coming up with complementary treats is even better. 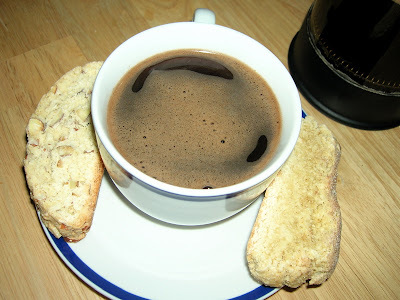 I leafed through some biscotti recipes but never got around to them ... until Wednesday night. I had the good fortune of getting to try my hand at Ginger and Almond varieties of biscotti while in Austin. And, better yet, I got to take some home with me. Thanks, Sash. These puppies are pretty easy to make, so expect more variations in the future. Thanks, Margo. I've got nothing but respect for your design skills — be it print, pastry or postcard. It's all good, clean and smart. Yeah, there definitely was some major turbulence in that particular USA weekend sky. Whew, what a mess! I'm glad your mess didn't make it to press. I had to look it up. But now that I know what brigadeiro is, all I can say is freakin' awesome. Brasilians know what's up. Yum!